MoonMarble.com - Geoffrey Beetem - "Rainbow Spiral with Latticino Core Marble"
Art Glass → Contemporary Handmade Marbles → Geoffrey Beetem - "Rainbow Spiral with Latticino Core Marble"
This is a contemporary handmade marble by Geoffrey Beetem. It is a rainbow band of colorful canes and sparkly dichroic wrapping around the outside with a latticino core of fine white and black lines. 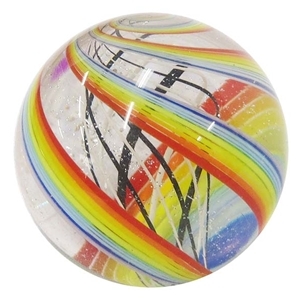 The marble measures approximately 1 1/2" in diameter. It is signed and dated.